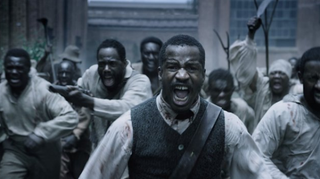 For a while, all we had was this breathtaking photo from Nate Parker's The Birth of a Nation film. It's the biopic about Nat Turner, the early-19th-century slave who rounded up other slaves and led a rebellion against white slave owners, killing some 60 white people in Virginia in 1831. Parker wrote, directed and is starring in the independent film. On Monday night the film premiered at the 2016 Sundance Film Festival in Utah, and those in attendance left the theater singing the film's praises on social media. The Root, which was in attendance, lauded the film as well, and spoke with Parker. After news broke about Fox Searchlight securing worldwide rights to the film for $17.5 million—which, as Deadlie explains, is the biggest sale a Sundance premiere has ever seen—fans of Parker and the movie rejoiced on Twitter. People are already calling the movie a strong contender for the 2017 Academy Awards, which I suspect will anger some black folk, since there's the idea that only black movies about slavery and racial injustice receive praise and recognition from mainstream award shows. By most accounts, the movie was absolutely riveting: strong cast, strong script and strong delivery. Congratulations to Parker for the distribution deal. I'm loving that it was written and directed by, and stars, a black man.